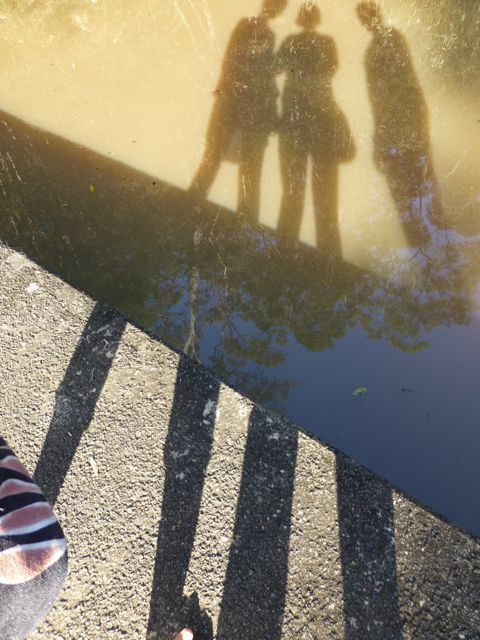 We are fascinated with our bodies and the shadows they project. 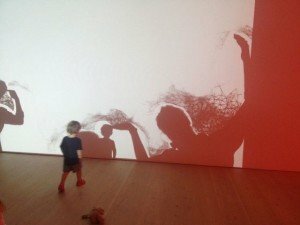 From making hand shadows by creative molding and twisting of our hands and fingers under a projector light to interactive artistic works that encourage you to move and twist to make larger than life shadows on public walls such as Felix Bonowski’s Proximity Repulsion, recently shown at the Saatchi Gallery. Then there is Nature that does it on your behalf, making elongated and strange shapes of you from winter late afternoon suns. There is something magical about projecting yourself as a flat moving dark shape to appear in front of you onto a surface such as a wall, grass or water, using either natural or artificial light. You never think of it as blocking out light but as an extension of your embodied self that you are in control of; making it bigger, smaller, wider, animal or head like. Felix’s interactive projection is captivating and compelling: a rain of particles falls from the top of the projected shadow and if one hits the edge of it, a repulsive force pushes it away from your head, arm or hand. The effect is to feel like one is playing with particles in a way similar to water or sand but by bouncing off one’s shadow. It is a beautiful piece. Last week, I went to the Science Museum and came across a new exhibition called “3D: printing the future”. There was a fine collection of plastic artefacts, and various replacement body parts for cars, planes and people. 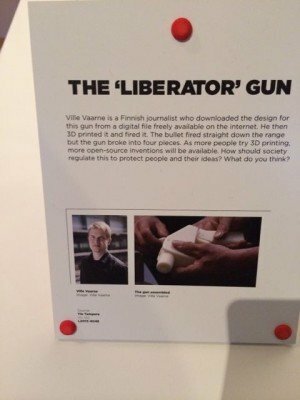 They even had a facsimile of the liberator plastic gun that was 3D printed recently and which caused a furore in the press. And there was also an amazing 3D printed sculpture that was a combination of MRI scans and St Paul’s Cathedral by the artist Tobias Klein. 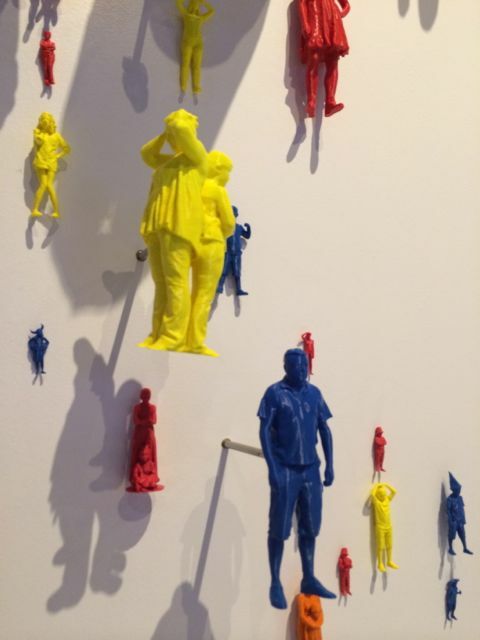 But what really caught my eye was lots of jellybean coloured plastic figurines – like the ones you used to find in cereal packets – hanging from the wall at the end of the exhibit. On closer inspection I discovered they were 3D scans of real people who had visited the museum. They had chosen their own colour and pose. Each was unique in a quite different way to having your photo taken. Whilst no longer attached to the body in the way shadows always are, it felt as if there was still a part of the person in the 3D model. Like little people who might start to come alive as they do in the classic Pixar animation film Toy Story. Only last week, the UK supermarket, ASDA, announced it was launching an in-shop 3D printing service that will scan your whole body to create an 8-inch version of you. Now just imagine getting the whole family done, aunts and uncles and all. And then turning the lights off and putting the projector on… one could act out family dramas with their like-like shadows coming alive. Perhaps, it might get a tad creepy, even uncanny valley.